Evenly dispersed block stiffness - same level of stiffness in the center and the shoulder for stronger grip and traction, prevents irregular wear. Uni-Directional V-shaped main groove enhances streamline form and also improves aquaplaning ability at high speeds. Wide angle grooves increase block stiffness, further enhancing tire's grip and traction. Engraved pattern name along the groove creates an exquisite product image. Sub-grooves on the shoulder disperse block stiffness, improving ride comfort, grip and traction. Complete block stiffness provides excellent lateral stability in cornering. The 595RS-R is beefed up by reinforced steel on the sidewall to promote the sharpest high speed cornering and fastest lap improvement. Proven on the circuit, the 595RS-R is highly acclaimed and much demanded for drifting, sprinting and track-day applications. The sleek design and ultra high performance of the 595RS-R makes it the number one choice for those requiring a motorsport tire but with the assured standards of a street legal tire. 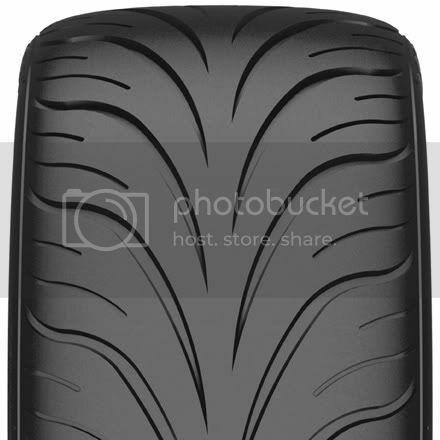 Even DOT approved or E-Mark approved Federal competition tyres are designed and compounded for competition use only and are not intended for highway or road use.